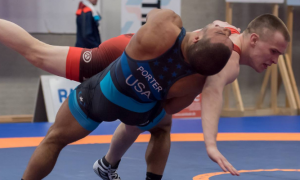 The semifinals of the 2018 Fargo Junior Greco-Roman Nationals are now set with a eight athletes who are either current or former age-group World Team members all advancing. 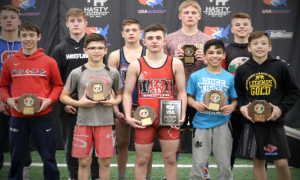 In one of Friday morning’s marquee match-ups that also turned out to end surprisingly early, 2017 Cadet World Team member Ridge Lovett (132 lbs, ID) blew past fellow prospect Luis Hernandez (FL) via fall. 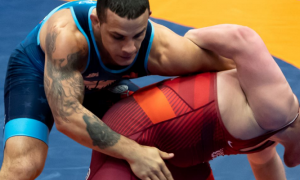 After snapping off a pair of arm throw attempts, Lovett hurled Hernandez off the edge with a mighty bodylock for five. 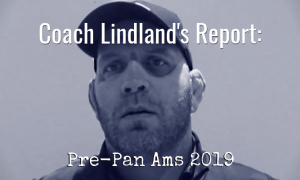 He earned two more on a Hernandez try at double overhooks by landing on top. Lovett wasn’t done, netting another pair of points on a correct throw. Following a pause in the action, Hernandez locked around the body, looking to close the gap. But as he went to hurl it back, Lovett high-legged and stepped over, once again landing on top only this time holding on for the fall. He’s only had two matches in this tournament so far, but fresh-from-Croatia Brendan Chaowanapibool (106 lbs, WA) was dominant in both. Yesterday, Chaowanapibool quickly brushed past Suan Sang (OK) with a :21 tech. This morning, the Cadet World Teamer clicked the lights off on Humberto Duarte (NV) in the first period by uncorking a beautiful arm throw that nearly resulted in a fall. When Duarte found his stomach, Chaowanapibool locked and loaded for a four-point lift. Because Duarte was also banged for a caution-and-two, that was all she wrote. At the Cadet Worlds two weeks ago in Zagreb, Chaowanapibool went 0-1, dropping his only bout to Dmitri Khachidze (GEO) 6-5. Two athletes on the 2018 Junior Team are in position to claim national titles. Peyton Omania (152 lbs, CA — 2016 Cadet WT) has been on a scorching run, picking up a pair of techs on Thursday before downing Colby Njos (MN) this morning 13-2. Tyler Dow (160 lbs, WI) outscored his three opponents yesterday 35-5 and kept rolling along in Friday’s quarters by securing a 36-second pin over Keller Rock (AZ). Rock reached back for a headlock, Dow clasped around and pressured into Rock, essentially catching him right then and there. They were all over the place, athletes with World Championships experience. 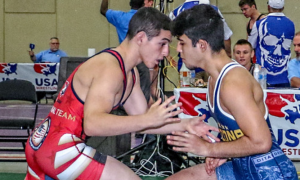 In the 113 lbs quarters, Andrew Chambal (MI, 2016 Cadet WT) locked horns with Kase Mauger (WA, 2017 Cadet WT) and prevailed 15-8. 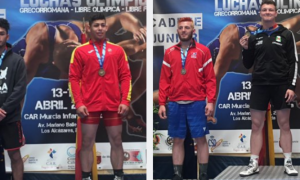 2018 Cadet World Team members James Burks (152 lbs, NE) and Luke Luffman (220 lbs, IL) both got the job done, but in different ways. 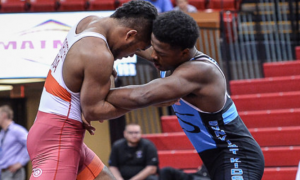 Burks was engaged in a gritty battle with Illinois’ Dalton Jensen leading on criteria 1-1 when he executed a nice straddle lift to widen the gap to 5-1. Jensen kept coming on late, but Burks still managed to come out on top 7-3. Luffman was not tested much on Thursday. In the 220 lbs quarterfinal, Garrett Kappes (MD) was hanging in there, facing a doable 4-0 deficit entering the second. Luffman upped the physicality later on in the match thanks to a couple of throws, including a side lift with 1:25 left in the bout to end it altogether 11-0. NMU/OTS commits Delon Kanari (132 lbs, IL) and Tommy Brackett (182 lbs, TN) are on the right track. Kanari decision Georgian Paul Watkins 7-1 and will be going against talented age-grouper Reece Witcraft (OK) in a little while. Brackett found himself in a dogfight with Julien Broderson (IA), emerging 8-5. 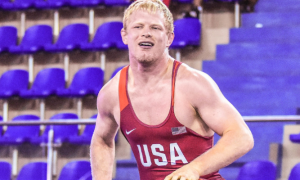 It won’t get easier for him in the semis, as the always-tough Zach Braunagel (IL) will be standing across. Brackett was a Fargo winner in 2016 before taking third here a year ago. The Fargo Junior Greco semifinals will be getting underway shortly and can be viewed live on Flowrestling (subscription required). The finals are slated to begin at 3:00pm EST.